Portland greeted the arrival of autumn with the return of the rain. So as I’ve fallen asleep and woken up to the rain the past couple days, I’ve been feeling especially grateful The Lucky Penny has her roof. Back in June a wonderful crew of Tiny House Helpers assisted with Sheathing My Vardo Roof. We coated the sheathing with two layers of R-Guard Cat 5. 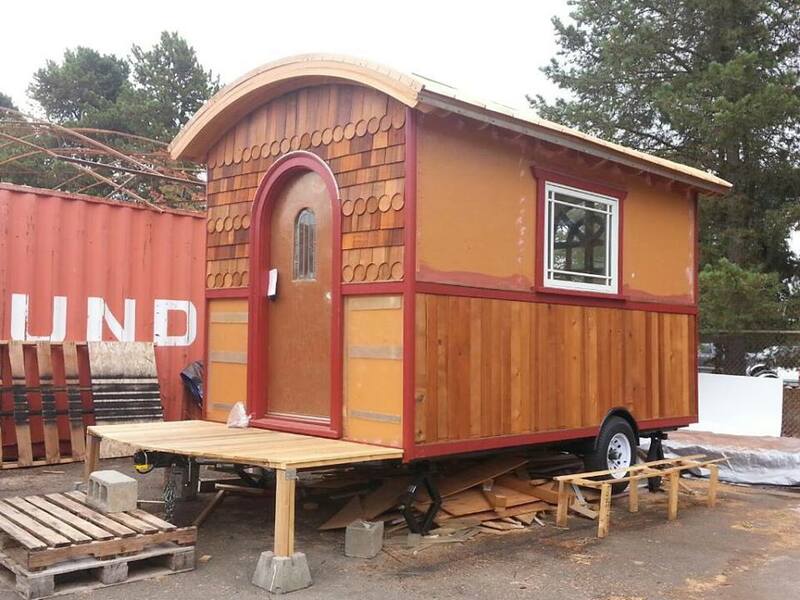 Two weeks later I left town for several weeks to travel and teach the Tiny House Design-Build class at Yestermorrow. My goal had been to get dried-in before I took a break from my tiny house build and fortunately, I succeeded. My time away gave me plenty of chances for Musings on My Vardo Roof Box. But, of course, my roof wasn’t really finished yet. So at the end of August Fred Nordgren from Taylor Metal Products delivered my custom metal roof panels – in copper penny color, of course. He managed to do the snaplock panels for me, which I prefer to the batten and T-panel system, but he said it was a stretch. So I’ll plan to do the next curved roof at a slightly shallower curve. It will still be plenty dramatic! Over Labor Day Weekend, Tim Bancke and his crew, Jeremy and Shaine, installed my metal roof. I was out of town for the weekend so it was really exciting to receive the photos from Tim and return to see my beautiful roof in place. My roof is, shall we say, complicated –which at one point resulted in me resorting to Plan F: Take 2 – so there were a couple little flashing details we still had to work out. If you’re in the market for a metal tiny house roof, please get in touch with Fred – and tell him Lina sent you! 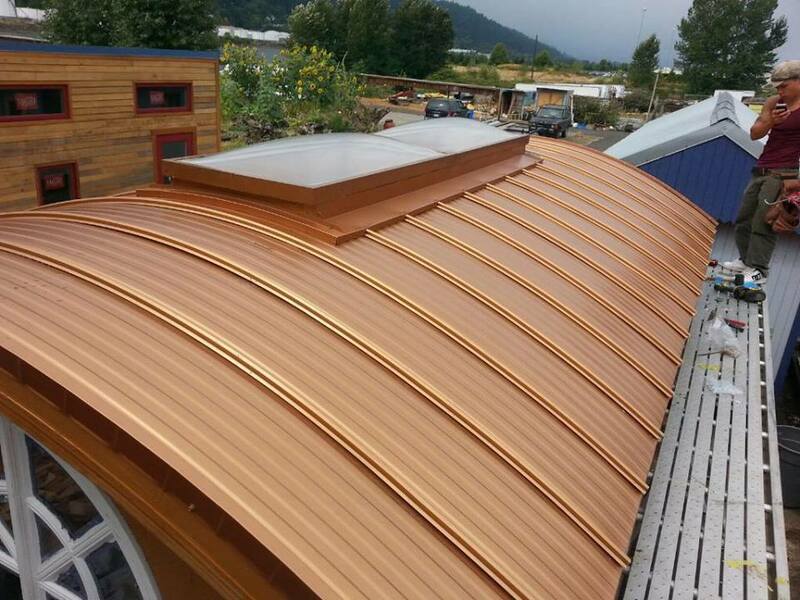 (If you’re not doing curved roof, Taylor Metal is still a great option. Laura got her roof panels from Taylor and, badass that she is, installed the panels herself, which you can read about in her post The Hat.) And, if you can get onto his busy schedule, I definitely encourage you to have Tim do your installation. (If your roof is complicated, it's worth the wait to have the pros do it right!) Tim and his crew say they enjoy doing tiny house roofs because they're interesting little projects. So this past Saturday Tim and his crew returned to finalize the details. They cut curved flashing from copper penny sheet metal to cover up the curved rafters at the front and back of the house. They tucked a bit more flashing under the eave flashing to cover the Eave Caps for My Vardo Roof. And they installed a flashing extender around my skylight box before installing My Custom Skylight from Mark at Natural Light Skylight Co. It’s lovely and I can’t wait to get my hammock hung up to admire the rain, stars, and clouds! The point of a roof is to protect the house from the rain, but it certainly doesn’t hurt that mine is beautiful, too!